Optomec’s Aerosol Jet 300 is a totally new 3D printer of a different order. It has been developed to produce biological and electronic designs at the nanoscale. The Aerosol Jet 300 is able to process ‘biologics’ and metals by loading the materials through the automatic spray onto any viable substratum. The very essence of the Aerosol Jet 300 is completely different from the conventional rapid manufacturing and rapid prototyping appliances, as at present it is able only to add circuitry and electronic constituents to the already developed designs. As the Aerosol Jet 300 is capable of processing biological materials and polymers, it can work with a wide range of applications. This ability allows the machine to grow in the developing sphere of additive manufacturing. The Aerosol Jet 300’s capability to produce 3D electronic components and circuits derives from the unique ways to do so. In contrast to other kinds of 3D printers, the basis of the 300 is the aerodynamic aerosol system, which uses polymer, biological or metallic “inks”. As soon as the inks are loaded to the system’s atomizer, they are split up into fine tiny aerosol drops (each of the diameter 1-5 microns) and are transmitted with N2 or squeezed air spray to the deposition head of the system. As soon as they reach the head, the next stream of squeezed gas is added into the mixture encircling the ink into a focusing ring. With the ink flowing from the deposition head, it gets compressed and concentrated, and, as the result, there is a fine mist of ink, which can position the CAD design straight on any smooth surface. And not only can the 300 jet inks onto almost any material, but it also can print onto such surfaces as spheres, irregular polygons and others. When the design is ready and is on the target surface, there should be done some post-processing operations in order to ensure that the required properties of the ink reach the full potential. If you use the metallic inks, there should be the stage of a thermal sintering process in order to intensify the adherence and electrical conductivity. In case with polymers, the UV process is necessary for baking inks onto the surface. 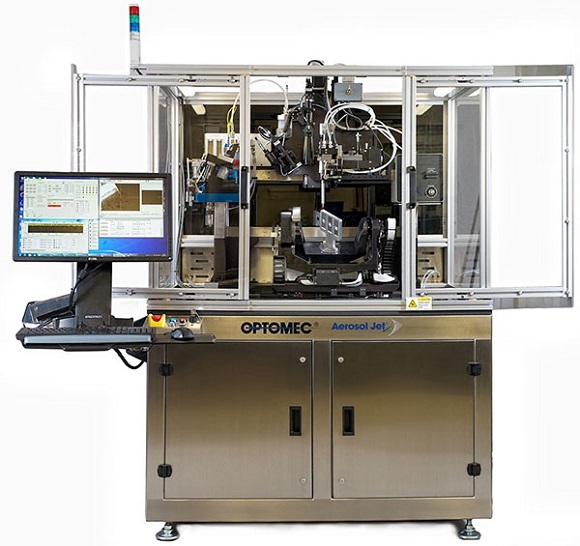 Despite the Aerosol Jet 300 being just an additive manufacture machine, the Optomec is looking forward to complementing the Aerosol system with the conventional techniques of rapid prototyping, so that metal and plastic components could be implanted with 3D electronic systems. If they manage to do what they are planning, the 300 is likely to become a precious device in various industries – from consumer electronic and biometrical devices to sensors and solar cell manufacturing.